Park Range installs solid and hollow bar micropiles using hydraulics and air, with rotary or percussion heads, continuous flight augers and down-the-hole hammers. 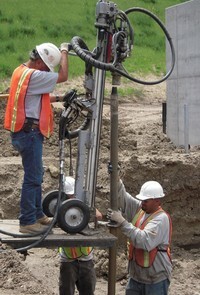 Micropiles are drilled and grouted piles with diameters 4″ – 6″. We typically install micropiles 30 – 100 feet into the ground supporting loads from 20 to 100 kips. What is the benefit of using a micropile? Micropiles are installed for new foundation support or for underpinning existing foundations. They are also installed diagonally for tension, tiebacks or soil nails. They are a perfect solution for drilling extremely hard rock and soil layers. Park Range can also install micropiles in spaces with low overhead clearance, basements and limited access areas to stabilize structures or for additional foundation support. Micropiles are a great solution when using conventional concrete caissons is not possible. Problem conditions can be limited access job sites, soils with high blow counts, drilling into bedrock, obstructions, nearby structures and unstable areas such as sinkholes, underground rivers and caves.